The Best Electron Beam Imaging Publication 2017 is awarded to Dr. Yuliya Klymenko in the group of Professor Sharon Stack, Director of Harper Cancer Research Institute and Professor in the Department of Chemistry and Biochemistry. Klymenko and coworkers published a paper entitled “Heterogeneous cadherin expression and multicellular aggregate dynamics in ovarian cancer dissemination”. 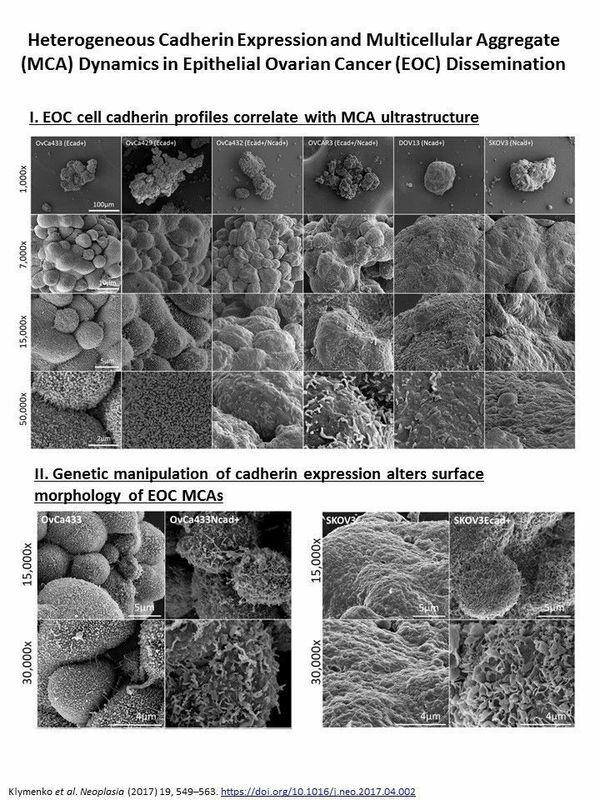 The study work used a Field Emission Scanning Electron Microscope (FEI Magellen) and a Transmission Electron Microscope (JEOL 1400) to evaluate the contribution of cellular cadherin composition to MCA phenotype by visualizing surface topography of 3-dimensional MCA’s grown in vitro using the panel of EOC cell lines, with high resolution and magnification ranges. Using these images, they were able to identify striking cadherin-dependent differences in aggregate surface ultrastructure. Collectively, these findings support the hypothesis that MCA cadherin composition impacts intraperitoneal cell and MCA dynamics and thereby affects ultimate metastatic success. The study was published in Neoplasia, 2017, 19 (7):549-63. The Best Biological Imaging Publication 2017 is awarded to Dr Jeremiah Zartman, an Assistant Professor in the Department of Chemical and Biomolecular Engineering. Zartman and coworkers, including Professor Alber and Professor Goodson published a paper entitled “Whole blood clot optical clearing for nondestructive 3D imaging and quantitative analysis”. 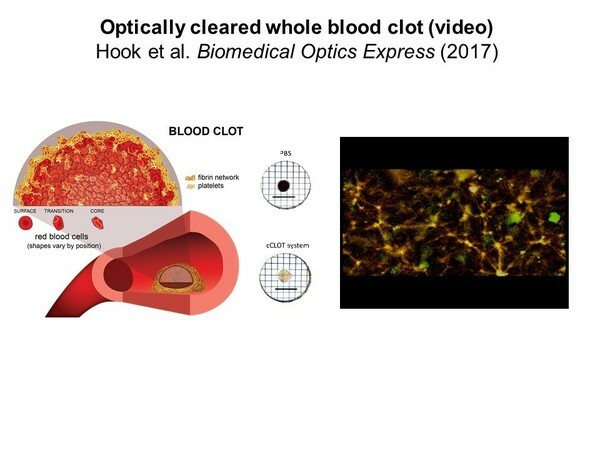 The study addressed an optimized optical clearing method termed cCLOT that renders large whole blood clots transparent and allows confocal fluorescence microscopy close to one millimeter inside the clot. Zartman validated the utility of cCLOT by demonstrating a quantitative structural difference in the fibrin network appearance when clot contraction is impaired pharmacologically with blebbistatin. The group also measured erythrocyte volumes at different depths inside clots and showed the volume remains the same during contraction, suggesting that contraction depends solely on reducing extracellular space. This finding indicates that clot contraction is not due to osmotic changes in erythrocytes but rather due to a higher compaction of the cells. The study was published in Biomedical Optics Express, 2017, 8 (8): 3671-3686 . Originally published by Sarah Chapman at imaging.nd.edu on April 25, 2018.